Carpet beetles. Many of us have seen them but few people know what these miniscule insects are actually capable of. Often times mistaken for “some sort of ladybug” because of their characteristic shape and sometimes spotted carapace, Carpet beetles are small (about 1/8th to 1/4th of an inch long), dome-shaped insects with an appetite for fashion and furniture. Their economic importance stems from their unusual ability to digest keratin, the chief protein component of skin and hair affording them the ability to eat clothing, carpet and upholstery. They can be a significant nuisance in the home, in storage facilities, museums, and clothing stores. It is also not uncommon for the discarded molt skins from the larval stage to trigger asthmatic episodes in some individuals. Here are 4 tips from the pest control experts at American Pest to help you and your family to avoid having to deal with the problems associated with these cryptic insects. While Carpet beetle adults are typically the first sign of an infestation they primarily feed on pollen and are usually of no consequence to homeowners. Carpet beetle larvae are responsible for damage to clothes, ornamental decorations, and other natural fiber house wares and are what you should be seeking to control. If you look closely, you can usually find traces of their discarded molt skins (http://lancaster.unl.edu/pest/images/dermestid/dermestidskins.jpg) in dark closets. Be on the lookout for them in the folds of stored clothing, the fringes and brims of hats, or in areas where dust tends to accumulate. Inspecting window sills and light fixtures will likely be a waste of time in your effort to control Carpet beetles. Remember that damage is caused by the slow-moving larvae, which are found feeding in dark, secluded areas of closets, beneath furniture, or at the junction of where carpeting meets a wall. Adult Carpet beetles have wings, are capable of flight, and are typically attracted to light and windows. Females tend to lay eggs in clusters of lint where the larvae can emerge and sustain themselves on a high quality source of both essential proteins and oils shed by humans and pets alike. 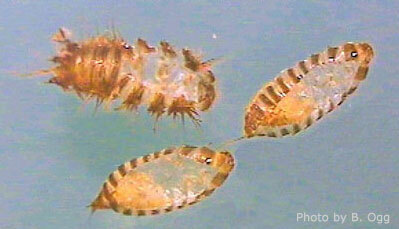 More mature larvae tend to be more mobile and can sometimes be found crawling up walls or across ceilings. It is not unusual to find that the source of an infestation is a pile of neglected clothing in a basement or abandoned upholstery in the attic so it is important to be thorough when checking for these fabric pests. Occasionally Carpet beetle infestations can be the result of bird or wasp nests in wall voids where the larvae are feeding on discarded feathers and debris. A residual, chemical insecticide such as Tempo SC Ultra can be an effective way to control Carpet beetles, as the active ingredient controls for several weeks. When used correctly, Diatomaceous earth may also offer a natural solution for Carpet beetle infestations. Diatomaceous earth is a powdery white dust that functions as an insecticide by wearing away the insect’s outer layer of protection. Without it, the insect can no longer regulate water loss and it dries up and dies. This all natural product has the added benefit of being non-toxic to humans and pets. Sanitation and prevention are the best ways to control the economically important stage of the carpet beetle life cycle. Insecticides typically aren’t necessary. In some situations, routine vacuuming can be all that’s needed to contain or eradicate a small infestation. You may want to invest in a vacuum cleaner with settings to allow for more effective cleaning near walls. If possible, try rolling back carpeting a fair amount and vacuuming under it; as some species preferentially lay their eggs beneath carpeting. Some measures are as simple as refraining from planting Pyracantha or Spirea shrubs near homes as they are more attractive to adult carpet beetles as a source of food. It’s also a good idea to dust surfaces regularly and get rid of accumulations of lint especially those around air vents. Lastly, try not to leave clothing or furniture in storage indefinitely. In temperature controlled buildings, it creates ideal conditions for larval carpet beetle development when those items could function better as donations. These simple tips should be enough to help any Do-It-Yourselfer handle the threat of carpet beetles but if there is a situation that seems to be beyond what you can legitimately hope to control, American Pest has several family safe and effective methods to safe guard your belongings from these ravenous fabric pests. Be sure to give us a call and allow for one of our knowledgeable representatives to further assist you.